This mountain is located near the west coast. Locate the town of Katsuyama. Hwy. 157 runs north from here, then along the west side of a water reservoir about 30 kilometer north. Just before the reservoir, you get to the small town of Shiramine. Turn right here, onto Hwy. 33 that will take you south-east into a very distinct valley. The road eventually climbs above the valley floor and continues in the steep hillside with the calley floor down on the drivers right hand side as you continue uphill. Shortly after reaching 1200 meter of elevation, the road forks. The road that continues uphill may be closed to general traffic, while going down to the right is access to a large parking area. There is a smaller parking lot just before this fork as well. A few cars may also park along the side of the road that forks downhill. This location is N36.12387, E136.73543, elevation about 1250 meter. If you park near the road fork, then just continue uphill along the paved road to a building/center located where the road makes a hairpin turn left and where there may be a second access barrier for cars. There are two main trails that leads directly to the summit from this area. The main trail starts out across a big pedestrian suspension bridge. The alternative (secondary) trail heads directly up into the hillside. There are clearly marked signs at this place. The smaller trail climbs the hillside and attains the main ridge which is then followed to a point where the two alternatives merge. The main trail is detailed a bit more in what follows. Cross the bridge and follow the well marked and in many places, improved trail as it climbs uphill. At elevation around 1960 meter, the trail reach a shelter with good views of the terrain all around. Stay left at the fork as the trail gradually tarverses left, into a small valley, then more steeply uphill to reach the main crest among some huge boulders. At this point, N36.14421, E136.76199, elevation about 2330 meter, the trail merges with the alternative trail mentioned above. From here, cross a large, flat plateau, mainly on boardwalks, then ascend a hill to gain a second, smaller plateau. 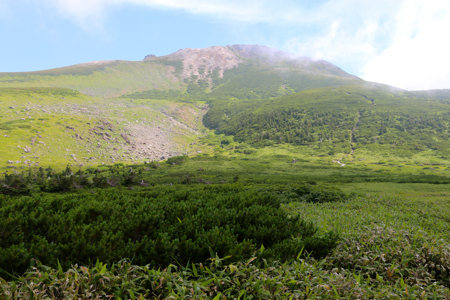 At this location, there is a large hut for hikers. You are now quite close to the final summit, the route runs more or less directly uphill and tops out on a short, summit ridge. We stayed in hotel Happo, directly across the reservoir (south end), in the main valley, having arrived from our unsuccessful attempt to climb Ontake the previous day. We left early and drove up the valley, seeing nobody until we arrived at a completely full parking lot near the road fork described above. Several Japanese officials pointed down the road to the larger parking, but before getting there, we noticed a car that was just parking on the left side of the road going downhill. We quickly adopted the same idea and parked just ahead of this other car. Leaving at 0710, we quickly walked up the road and found the two trails. A local person said that the trail that started across the bridge was steep, but with shade, while the other trail was steep with less shade. We took the route across the bridge and after about 1:10, we took a short rest in front of the shelter. Arriving at the trail fork on the edge of the plateau at 0900, we next ascended to the mountain hut. This hut was much larger than anticipated. We passed by and started up the last section of ascent. We arrived at the very summit by 0950. There had been quite many people on the trail from the very beginning and the summit was no exception. Lots of people, both pretty stationary as well as many coming and going. It was nice to sit up here and enjoy the view as well as observing all the activity. After a while, I suggested that Åke should hike over to the next, lower summit. He felt eager to do so and we agreed to wait for him. This small extra project took longer than expected (such things almost always do::), but eventually he returned after a successful side trip. We started our descent together at 1050, having agreed to fork right by the big boulder at the edge of the plateau and follow the ridge trail back down to the parking. This trail was significantly smaller and, in particular, an order of magnitude fewer people. Still, pretty nice as it stayed with the ridge quite a long time before falling off into the slope and descending quite steeply back down to the trailhead area. We were back by the car in 2 hours, at 1250. With an afternoon for driving, our next goal Daisen, was well within reach.